As a cocktail, I ordered the Manhattan Nero, their own version of a classic, made with Michter’s US-1 Bourbon and Amaro Averna. Very good, it was quite strong and had a beautiful dark color. For appetizer, I was not sure what to get between the octopus, the tripe, the lamb tongue or the sardines. I settled for the latter. The sardines were marinated and served with a deliciously sweet caramelized fennel and lobster oil (I did not get much of taste there). If you like fish, I recommend it and know that the sardines were perfectly filleted, so if you do not like this fish because of the multiple bones, you will not be disappointed. 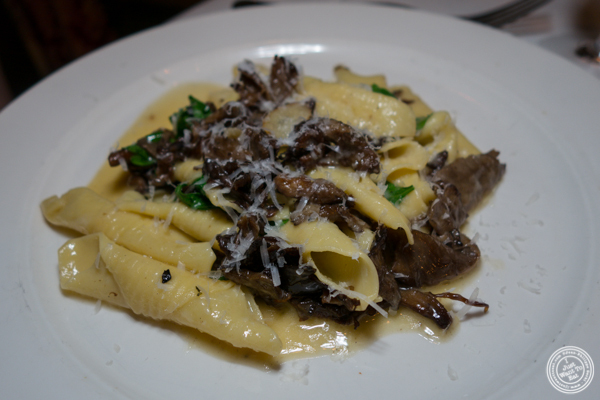 For her entree, Jodi ordered the Garganelli pasta with “Funghi Trifolati” or mushrooms. The pasta was superb, smothered in brown butter. But the best pasta dish was for me the beef cheek ravioli with crushed squab liver and black truffle. These ravioli were amazing: homemade, the shell was thin, perfectly cooked, with a filling that was very tasty, but not as much as the squab liver that I could have eaten on a piece of bread. As far as the truffle is concerned, I however did not smell or taste it...Still, it was a fantastic dish that I also recommend if you are non-vegetarian. I should mention though that, if you have a seafood allergy, it contains anchovy paste. For dessert, we could not resist not having the olive oil cake that was superb, not as good as the one at Maialino, but still delicious. At the end of the meal, with the bill, they gave us some Italian cookies that was a nice touch to end a delicious dinner. 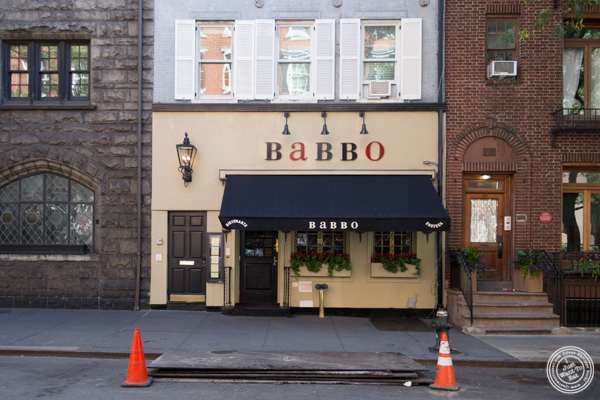 I am glad we finally got to try Babbo: it is now one of my top Italian restaurants in the City and I will surely go back!